To provide optimal safety to those working at height, Kee Safety has launched KEEGUARD Ladder Kit, a permanently fixed guardrail system that is used in conjunction with safety ladders and self-closing gates. 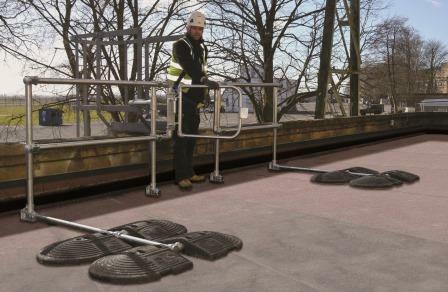 To ensure it complies with the standard, KEEGUARD Ladder Kit is a 'retro-fit' guardrail solution that fits to existing fixed ladder or cat ladders, providing 1.5m guardrailing on both sides of the ladder. Quick and easy to install, it simply clamps on to the existing fixed ladder, forming a continual link from the guardrail to the stringer. The kit's unique fitting can clamp around a flat or tubular stringer up to 75mm in width/diameter does not need to be mechanically fixed to the roofing membrane or building’s structure. “Awareness of the dangers of working at height has increased in the past few years, with legislations such as the Work at Height Regulations of 2005 coming into play” explains John Ingram, Group Product Manager – Fall Protection at Kee Safety. “Great steps have been made to ensure the safety of workers undertaking work at height, and we believe that the introduction of this new product is another step in the right direction. Available in a galvanised steel finish, KEEGUARD Ladder Kit has been independently tested and complies with EN 14122-4.